Have you ever waited for the postman to arrive with a sense of real excitement? Well that was me once I knew the brand new Mr. Crabtree book had been despatched and was on its way. I started fishing as a kid way back in the 1960’s and with a non-angling father I definitely wasn’t a Peter. In fact I don’t know why I gave angling a go in the first place but those were the days when you tried lots of things. And for me, angling stuck. Pre-internet times and not knowing any fishermen, one day I came across Mr. Crabtree and without trying to over-emphasise anything I was absolutely captivated. 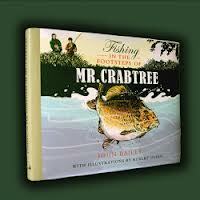 In fact, as a child, to me Mr. Crabtree was in the same category as Father Christmas – I actually thought he was real! It was only some time later I realised he was just a character in a book! Anyway, fast-forward to the present and the new publication. Whenever something is re-done and brought up to date the biggest danger is that the original magic is somehow lost. That is definitely not the case with Fishing In The Footsteps Of Mr. Crabtree. It manages to blend the original with the modern in such a way that while the nostalgic will not be disappointed, there is definitely something there for angler that has maybe never even hear of Mr. C and his son Peter. The format of the original cartoon-style presentation is adhered to, even down to the targeting of species according to the season. But don’t for one minute think it’s just a facelift job. Although the book satisfies those of us who may look back it definitely has something for the present as well. In all honesty I could go on and on with this review but ultimately the only way to share in the magic of Mr. Crabtree is to get the book for yourself! Regardless of age, angling experience or any other factor I have no doubt that if you’re even remotely interested in angling you will love the book. And wouldn’t it be great if the 2012 version inspired a new generation of anglers, just like it did for mine way back in the 60’s.